It’ll be a sad day when laksa – the legit ones – becomes an endangered species. Or char kway teow, prawn mee, bak chor mee and all those dishes we grew up on. But when was the last time you saw a 20-something fry up some killer orh lua? 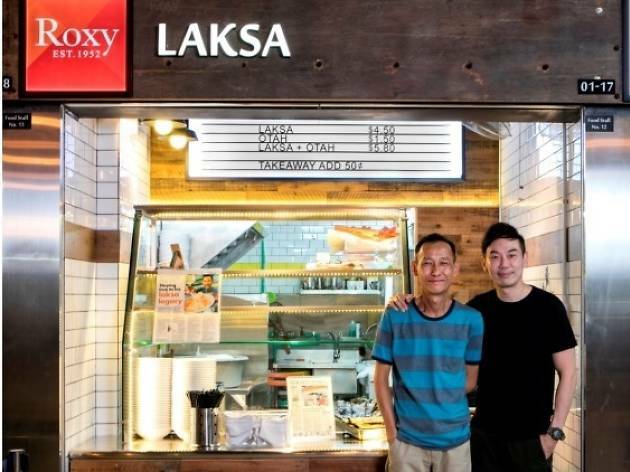 Currently, Low and Lim are test-bedding the concept with a Roxy Laksa stall at Timbre+. While it’s early days yet, the stall is experimenting with technology to reduce manpower costs and lower the barrier to entry without compromising the quality of the dish. One way they’re doing so is to develop ‘food processing stations’ that save the hawkers time and money. The two chefs are also working together to create a laksa paste, cooked up in a central kitchen, that will be available to the public – unfortunately the launch date for this has yet to be confirmed. And Low isn’t stopping at the Peranakan noodle soup. He’s creating chilled versions of hawker favourites, beginning with nasi lemak, that will be sold at convenience stores under the &Will brand. This, hopefully, will be available by the end of this year. Until then, we’ll have to pray no legendary hawker hangs up their aprons – yet.